The Dream Team: Chiropractic, acupuncture, massage & trigger point therapy for athletes. Would you believe that a totally free, 5 minute practice could be the difference between achieving a life-altering career peak and completely ‘you-know-what-ing’ the bed? Pro athletes are ALWAYS looking for an edge, and usually not on the banned substance list. A regular meditation practice has been proven through time and scientific research to improve focus, decrease pain, and improve resiliency. Want a piece of that? From 5 minutes to 5 hours it’s accessible to everyone from Kobe Bryant to you. Here is just a short list of the many athletes who consider meditation to be part of their regular mental training schedule. In fact, here is a free get-started resource on meditation via YouTube. Earphones, click, and chill. If you haven’t tried a yoga session yet that you LOVED, keep looking! The modern practice of yoga has morphed from a 5,000 year old esoteric practice to a mainstay of athletic training. Yoga for athletes is typically geared towards balancing strength with flexibility while improving stability. Yoga is good for healing injuries as well as staying off of the injured list. Drug-free and easy to access, from 1-1 sessions supervised by doctors to group classes in your community, yoga is here to stay on the protocol for these famous yoga-lovers. Here is a longer free yoga for athletes class online but you can, of course, find shorter ones to fit your schedule. 3) Rehab with the Pros. Sometimes a muscle stabilizer is out on a lunch break, a penalty move is absorbed, or an old injury returns like a bad ex. Pro athletes have their own medical squad like Miami Sports Chiropractic & Yoga Center on speed dial. It can be any mix of team doctors, outside private practitioners and alternative care specialists. Working with pros of all sports – MSCYC prescribes prehab AND rehab for high level athletes using chiropractic, physical therapy, acupuncture, trigger point therapy, Pilates, yoga, stress relief techniques and nutrition. Think of fine tuning a race car. Check out Dr. Amber Sala doing low back decompression with the big man himself. 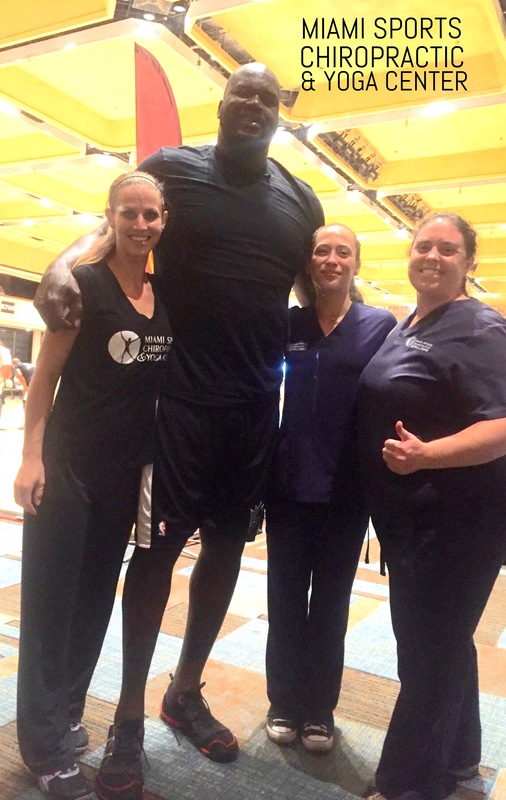 MSCYC was hired to be the on-site sports rehab providers for the Shaquille O’Neil fantasy basketball camp in June 2016. 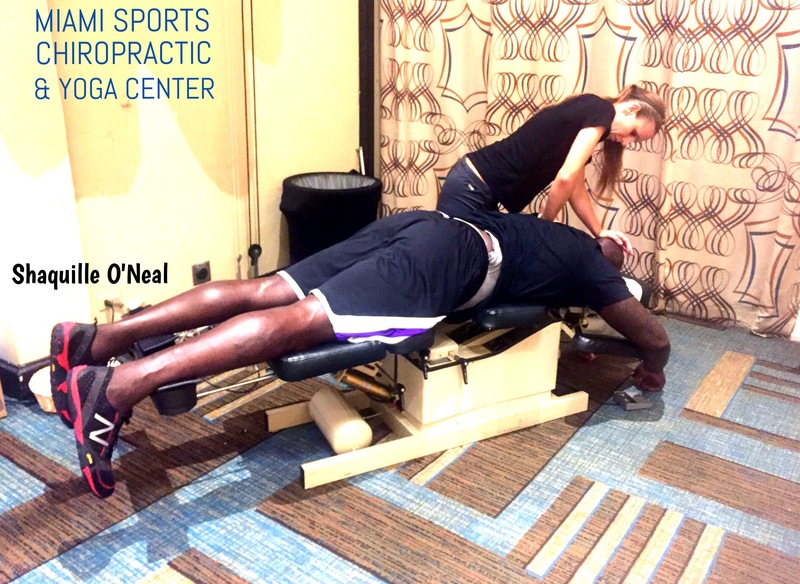 Dr. Amber Sala, chiropractor and registered yoga teacher treating Shaquille O’Neil at his basketball camp.